One of the challenges shared by patients, families, clinicians, and researchers is confusion about how to classify and label frontotemporal disorders. A diagnosis by one doctor may be called something else by a second, and the same condition or syndrome referred to by another name by a pathologist who examines the brain after death. 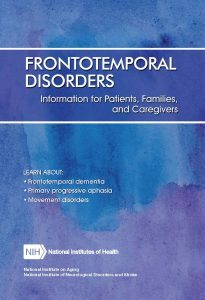 For many years, scientists and physicians used the term frontotemporal dementia (FTD) to describe a group of illnesses. After further research, FTD is now understood to be just one of several possible variations and is more precisely called behavioral variant frontotemporal dementia, or bvFTD. To describe all diseases in this groups, we now use the term frontotemporal disorders with frontotemporal lobar degeneration (FTLD). Frontotemporal disorders are the result of damage to neurons (nerve cells) in parts of the brain called the frontal and temporal lobes. 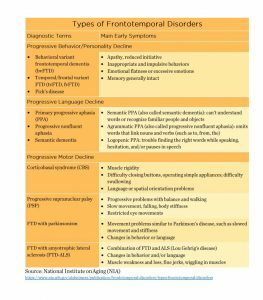 Almost all prime of life disease are part of the frontotemporal disorder spectrum. As neurons die in the frontal and temporal regions, these lobes atrophy, or shrink. Gradually, this damage causes difficulties in thinking and behaviors normally controlled by these parts of the brain. Many possible symptoms can result, including unusual behaviors, emotional problems, trouble communicating, difficulty with work, or difficulty with walking. Behavioral variant FTD (bvFTD) is the form of frontotemporal disorders (FTD) characterized by early and progressive changes in personality, emotional blunting, and/or loss of empathy. Patients experience difficulty in modulating behavior, and this often results in socially inappropriate responses or activities. Impairment of language may also occur after behavioral changes have become notable. Patients typically start to have symptoms sometime in their 50s, though it can occur as early as at age 20 or as late as age 80. As with all FTD, the course of bvFTD will vary from one person to another. Not every symptom will be experienced by every person, nor will these symptoms develop in a pre-ordained sequence. The hallmark of bvFTD is a progressive deterioration in a person’s ability to control or adjust his or her behavior in different social contexts that results in the embarrassing, inappropriate social situations that can be one of the most disturbing facets of FTD. People manifest a loss of empathy early in the disorder that is often seen as indifference toward others, including loved ones. Apathy or lack of motivation may also be present. The patient typically does not recognize the changes in his or her own behaviors, nor do they exhibit awareness or concern for the effect these behaviors have on the people around them. The hallmark of FTD is a gradual, progressive decline in behavior and/or language (with memory usually relatively preserved). As the disease progresses, it becomes increasingly difficult for people to plan or organize activities, behave appropriately in social or work settings, interact with others, and care for oneself, resulting in increasing dependency on caregivers. Onset of FTD often occurs in a person’s 50’s and 60’s, but has been seen as early as 21 and as late as 80 years. Roughly 60% of cases occur in people 45-64 years old (Knopman, 2011), thus FTD can affect work and family in a way dementia in older patients does not. There are currently no treatments to slow or stop the progression of the disease. Although specific symptoms may vary from patient to patient, bvFTD is marked by an inevitable deterioration in functioning. The length of progression varies, from 2 to over 20 years with a mean course of 7-13 years from the onset of symptoms (Onyike and Diehl-Schmid, 2013). bvFTD itself is not life-threatening. It does, however, predispose patients to serious complications such as pneumonia, infection, or injury from a fall. The most common cause of death is pneumonia. Primary progressive aphasia (PPA) is a language disorder that involves changes in the ability to speak, read, write, and understand what others are saying. It is associated with a disease process that causes atrophy in the frontal and temporal areas of the brain and is distinct from aphasia resulting from a stroke. In 2011, criteria were adopted for the classification of PPA into three clinical subtypes: nonfluent/agrammatic variant PPA, semantic variant PPA and logopenic variant PPA (Gorno-Tempini, Hillis, Weintraub, et. al). The presenting feature in people with nonfluent/agrammatic PPA is deterioration in their ability to produce speech. These patients first become hesitant in their speech, begin to talk less, and eventually become mute. Current research suggests that the fundamental loss in nonfluent/agrammatic PPA is deterioration in knowledge of the grammatical organization and the production of sounds for language. Unlike other FTD subtypes, nonfluent/agrammatic PPA generally does not produce changes in behavior or personality until later stages of the disease. Most people with progressive aphasia maintain the ability to care for themselves, keep up outside interests and, in some instances, remain employed for a few years after onset of the disorder. The aphasia in nonfluent/agrammatic PPA is experienced as hesitant, effortful speech. Despite this difficulty, it appears that patients’ ability to comprehend what others say is preserved longer, though this is eventually lost, as well. 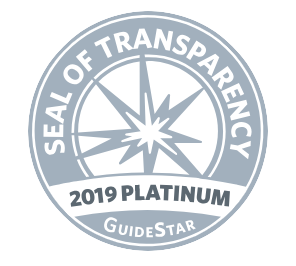 This brochure has been created by the National Institute of Neurological Disorders and Stroke (the NINDS), the nation’s medical research agency and contains the most up to date information available on symptoms, causes, diagnosis, and treatments of frontotemporal disorders.